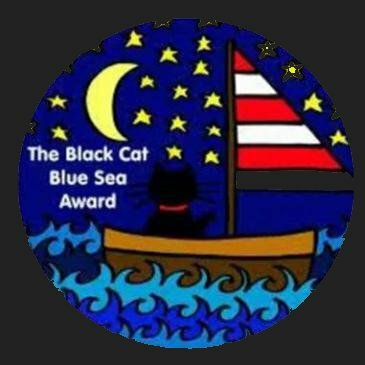 for nominating me for the The Black Cat Blue Sea Award! I see her as my friend who has an open and warm heart and first of all she is a human being to be derserved and treated in respect and love. If you could live anywhere in this world, where would that be and why? 1. Name three things you are grateful for. 2. If you could live anywhere in this world, where would that be and why? I would live on the island Fantasia, where people have learnt to live peacefully together, where all weapons have turned into helping hands, where all walls separating us from each other have overcome, where unity and oneness exists which is lived practically in dignity and honour, in humility and humanity towards the Creator as real brothers and sisters, as conscious co-worker of the divine plan. 3. What is your favorite pastime? When I was in India helping poor and needy people and enabled at least a certain number of them to live a life in dignity instead of living in poverty and misery. The following are three questions for the bloggers who I have nominated. a) What is the purpose of life for you? b) What could people do to make the world a bit better? c) What is the meaning of friendship for you?